Model: The locomotive has a built-in digital decoder and sound generator for operation with DCC and Selectrix. The motor has a flywheel. 4 axles powered. Traction tires. The headlights and marker lights change over with the direction of travel. The locomotive has a close coupler mechanism. The headlights and marker lights, the cab lighting, long-distance headlights, and many other light and sound functions can be controlled digitally. Length over the buffers 118 mm / 4-5/8". 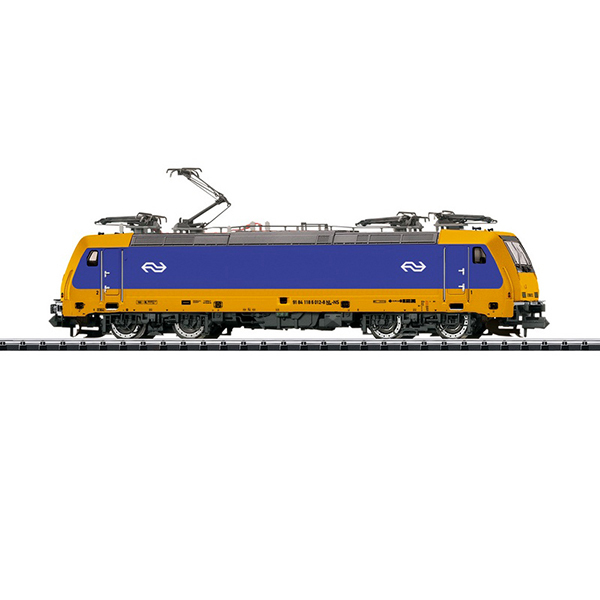 The class (E) 186 TRAXX racers can do 160 km/h / 100 mph on the Dutch Railways (NS) and they have not only conquered its high-speed routes but have also found a place in high quality express train service. The V250 HVG trains from AnsaldoBreda were actually planned for service on the Dutch high-speed route HSL-Zuid. E 186 units designed for 160 km/h / 100 mph had to be leased as replacements and they were placed in scheduled service starting in September of 2009 on the route Amsterdam – Schiphol – Rotterdam – Breda. After successful results, there are now plans for all ICRm trains to have PRIO cars with "Sandwich" multiple unit motive power (one locomotive at each end of the train) using the E 186. At present, the NS has available 20 leased E 186 units as well as about 30 newly ordered road numbers E 186 001-045.